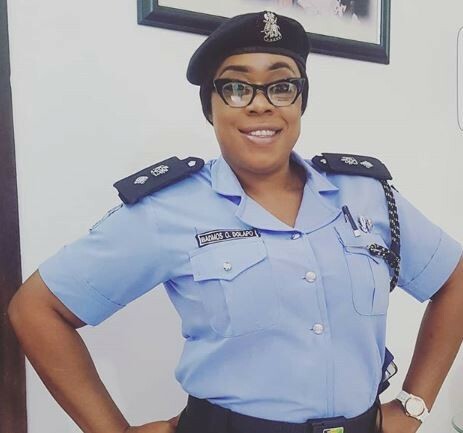 Beautiful Zone 2 Police PRO, Dolapo Badmos has cried out on social media warning those tagging her in posts to #EndSars to stop it. , ‘Hey! Stop tagging me to #Endsars kindly note that I didn’t start SARS and cannot end SARS! So I will appreciate if you can stop telling me to Endsars, my duty is to feed the public about police information and police about the public! Vice versa. I have written an open letter to the bad eggs in SARS’. She continued to say, ‘that’s my stand concerning them! #ifyouknowyouknow! 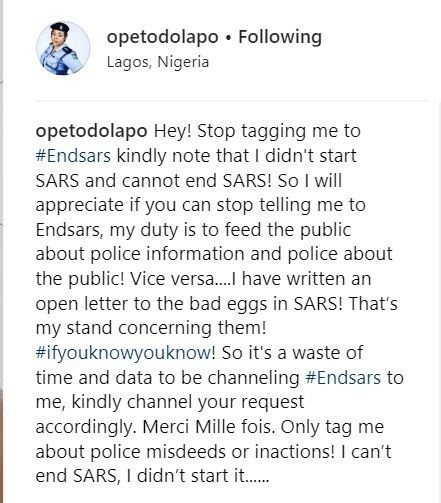 So it’s a waste of time and data to be channeling #Endsars to me, kindly channel your request accordingly. Merci Mille fois. Only tag me about police misdeeds or inactions! I can’t end SARS, I didn’t start it’.